Some time ago, I purchased an HP 1652b Logic Analyzer through e-bay. This is a great combination logic analyzer plus oscilloscope that was way ahead of its time. The one I purchased did not have manuals included, so I set about looking for manual on the web. Some searching showed a folder on the Agilent FTP that had a scan of the service manual, and the disk creation utilities and images, but not the operations manual. Alas, the last time I checked, the 1652b folder from the Aglient web site was gone. Soon thereafter, another HP 1652b Logic Analyzer showed up on e-bay, but this one had a full set of manuals in great condition. 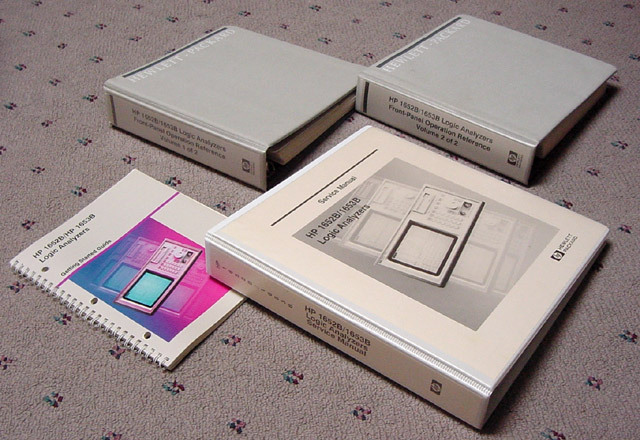 I contacted the seller and arranged to have the manuals sent to me by FedEx, I then scanned them and sent them back to the seller by FedEx so he could include them with the analyzer for sale. I originally intended to use the manuals only for my own use (which I have), but I have been thinking that the manuals may be useful to other HP1652b owners. The scans offered here are 600 DPI, with the Acrobat "capture" function turned on. This means that the scan is an exact 600 DPI image of the manual, but a second OCR version of the manual is "hidden" behind the scanned image. What you get is the best of both worlds, an exact copy plus the ability to search for terms. There are four books, with each available as a single file or as one file combining all the books. The big book is the most useful, since an Acrobat search will take you to any of the manuals that have matches for the search terms. I make no claim of ownership to this material. I am sure HP or Agilent still has copyright on all this material. Since they are not making it available, it would only be useful to people who own the analyzer, and I am not selling it, hopefully they will not ask me to remove the site. Hopefully if you have an HP1652B you will find these manuals and operation disk creation utilities useful. You are specifically asked not to sell this scan. Get your own manuals and scan them yourself if you want to try to make a profit at it. Please save the PDF files to your local disk ("right-click", "Save Target As") rather than viewing them online to help keep the bandwidth in check. If you like these manuals and feel like you should pay for them, please instead donate to your favorite charity. On the Agilent FTP site, there were disk images and a utility for creating both the operation and a service disk. It took some playing around to make that work. This zip file has instructions, the images and the disk creation utility. I have also included an archive of the 1652b branch of the site, which includes the original utilities and a lower resolution scan of the service manual.